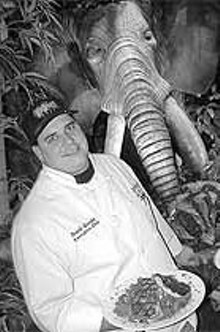 "Rainforest Cafe has something for everyone! Their menu includes a variety of specialty items from seafood, beef and chicken to pastas and pizza. Younger guests can enjoy items from our exciting new kids' menu! Plus, where else can you eat a VALCANO?! Not an ordinary dessert, our very own sparkling VALCANO lights up any meal! After your dining safari, pick up that special souvenir gift from your visit to Rainforest Cafe. Their Retail Village offers a WILD variety of items for the entire family"  From The Rainforest Cafe Website. Zucchini, tomatoes, Italian sausage, garbanzo beans, kidney beans, spinach, pasta, and Parmesan cheese. With sweet honey Sriracha glaze, steamed rice, Asian green bean stir-fry, and cilantro. Sauteed chicken, cavatappi pasta, walnut pesto, broccoli, red peppers, spinach, and garlic Alfredo sauce.